What kind of action is it to remove your hand from a two-handed weapon or re-grab it with both hands? Both are free actions. For example, a wizard wielding a quarterstaff can let go of the weapon with one hand as a free action, cast a spell as a standard action, and grasp the weapon again with that hand as a free action; this means the wizard is still able to make attacks of opportunity with the weapon (which requires using two hands). As with any free action, the GM may decide a reasonable limit to how many times per round you can release and re-grasp the weapon (one release and re-grasp per round is fair). Without a doubt, weapons number among adventurers’ most coveted possessions. Whether weapons are used as tools to lay foul monsters low, as the medium for magical enhancements, or as outlets for a host of fundamental class abilities, few heroes head into the field without their favorite—or perhaps even a whole arsenal of their favorites. This section presents all manner of nonmagical weapons for PCs to purchase and put to use, whatever their adventures might entail. The weapons presented here should be relatively easy to find and purchase in most towns and cities, although GMs might wish to restrict the availability of some of the more expensive and exotic items. From the common longsword to the exotic dwarven urgrosh, weapons come in a wide variety of shapes and sizes. All weapons deal hit point damage. This damage is subtracted from the current hit points of any creature struck by the weapon. When the result of the die roll to make an attack is a natural 20 (that is, the die actually shows a 20), this is known as a critical threat (although some weapons can score a critical threat on a roll of less than 20). If a critical threat is scored, another attack roll is made, using the same modifiers as the original attack roll. If this second attack roll exceeds the target's AC, the hit becomes a critical hit, dealing additional damage. Weapons are grouped into several interlocking sets of categories. These categories pertain to what training is needed to become proficient in a weapon's use (simple, martial, or exotic), the weapon's usefulness either in close combat (melee) or at a distance (ranged, which includes both thrown and projectile weapons), its relative encumbrance (light, one-handed, or two-handed), and its size (Small, Medium, or Large). Most character classes are proficient with all simple weapons. Combat-oriented classes such as barbarians, cavaliers, and fighters are proficient with all simple and all martial weapons. Characters of other classes are proficient with an assortment of simple weapons and possibly some martial or even exotic weapons. All characters are proficient with unarmed strikes and any natural weapons they gain from their race. A character who uses a weapon with which he is not proficient takes a –4 penalty on attack rolls with that weapon. Melee weapons are used for making melee attacks, though some of them can be thrown as well. Ranged weapons are thrown weapons or projectile weapons that are not effective in melee. Reach Weapons: A reach weapon is a melee weapon that allows its wielder to strike at targets that aren't adjacent to him. Most reach weapons double the wielder's natural reach, meaning that a typical Small or Medium wielder of such a weapon can attack a creature 10 feet away, but not a creature in an adjacent square. A typical Large character wielding a reach weapon of the appropriate size can attack a creature 15 or 20 feet away, but not adjacent creatures or creatures up to 10 feet away. Double Weapons: A character can fight with both ends of a double weapon as if fighting with two weapons, but he incurs all the normal attack penalties associated with two-weapon combat, just as though the character were wielding a one-handed weapon and a light weapon. The character can also choose to use a double weapon two-handed, attacking with only one end of it. A creature wielding a double weapon in one hand can't use it as a double weapon—only one end of the weapon can be used in any given round. Thrown Weapons: The wielder applies his Strength modifier to damage dealt by thrown weapons (except for splash weapons). It is possible to throw a weapon that isn't designed to be thrown (that is, a melee weapon that doesn't have a numeric entry in the Range column on Table: Weapons), and a character who does so takes a –4 penalty on the attack roll. Throwing a light or one-handed weapon is a standard action, while throwing a two-handed weapon is a full-round action. Regardless of the type of weapon, such an attack scores a threat only on a natural 20 and deals double damage on a critical hit. Such a weapon has a range increment of 10 feet. Projectile Weapons: Most projectile weapons require two hands to use (see specific weapon descriptions). A character gets no Strength bonus on damage rolls with a projectile weapon unless it's a specially built composite shortbow or longbow, or a sling. If the character has a penalty for low Strength, apply it to damage rolls when he uses a bow or a sling. Ammunition: Projectile weapons use ammunition: arrows (for bows), bolts (for crossbows), darts (for blowguns), or sling bullets (for slings and halfling sling staves). When using a bow, a character can draw ammunition as a free action; crossbows and slings require an action for reloading (as noted in their descriptions). Generally speaking, ammunition that hits its target is destroyed or rendered useless, while ammunition that misses has a 50% chance of being destroyed or lost. Although they are thrown weapons, shuriken are treated as ammunition for the purposes of drawing them, crafting masterwork or otherwise special versions of them, and what happens to them after they are thrown. This designation is a measure of how much effort it takes to wield a weapon in combat. It indicates whether a melee weapon, when wielded by a character of the weapon's size category, is considered a light weapon, a one-handed weapon, or a two-handed weapon. Light: A light weapon is used in one hand. It is easier to use in one's off hand than a one-handed weapon is, and can be used while grappling (see Combat). Add the wielder's Strength modifier to damage rolls for melee attacks with a light weapon if it's used in the primary hand, or half the wielder's Strength bonus if it's used in the off hand. Using two hands to wield a light weapon gives no advantage on damage; the Strength bonus applies as though the weapon were held in the wielder's primary hand only. An unarmed strike is always considered a light weapon. One-Handed: A one-handed weapon can be used in either the primary hand or the off hand. Add the wielder's Strength bonus to damage rolls for melee attacks with a one-handed weapon if it's used in the primary hand, or 1/2 his Strength bonus if it's used in the off hand. If a one-handed weapon is wielded with two hands during melee combat, add 1-1/2 times the character's Strength bonus to damage rolls. Every weapon has a size category. This designation indicates the size of the creature for which the weapon was designed. A weapon's size category isn't the same as its size as an object. Instead, a weapon's size category is keyed to the size of the intended wielder. In general, a light weapon is an object two size categories smaller than the wielder, a one-handed weapon is an object one size category smaller than the wielder, and a two-handed weapon is an object of the same size category as the wielder. Inappropriately Sized Weapons: A creature can't make optimum use of a weapon that isn't properly sized for it. A cumulative –2 penalty applies on attack rolls for each size category of difference between the size of its intended wielder and the size of its actual wielder. If the creature isn't proficient with the weapon, a –4 nonproficiency penalty also applies. The measure of how much effort it takes to use a weapon (whether the weapon is designated as a light, one-handed, or two-handed weapon for a particular wielder) is altered by one step for each size category of difference between the wielder's size and the size of the creature for which the weapon was designed. For example, a Small creature would wield a Medium one-handed weapon as a two-handed weapon. 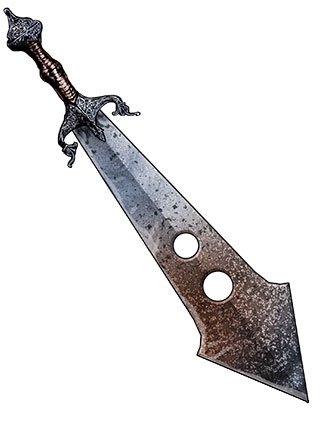 If a weapon's designation would be changed to something other than light, one-handed, or two-handed by this alteration, the creature can't wield the weapon at all. Sometimes objects not crafted to be weapons nonetheless see use in combat. Because such objects are not designed for this use, any creature that uses an improvised weapon in combat is considered to be nonproficient with it and takes a –4 penalty on attack rolls made with that object. To determine the size category and appropriate damage for an improvised weapon, compare its relative size and damage potential to the weapon list to find a reasonable match. An improvised weapon scores a threat on a natural roll of 20 and deals double damage on a critical hit. An improvised thrown weapon has a range increment of 10 feet. The following information is copied and slightly reworded from the broken condition. See the broken condition for the full, original text. Attacks made with a weapon with the broken condition suffer a –2 penalty on attack and damage rolls. Such weapons only score a critical hit on a natural 20 and only deal ×2 damage on a confirmed critical hit. Here is the format for weapon entries (given as column headings on Table: Weapons). Price: This value is the weapon's price in gold pieces (gp) or silver pieces (sp). The price includes miscellaneous gear that goes with the weapon, such as a scabbard or quiver. This price is the same for a Small or Medium version of the weapon. A Large version costs twice the listed price. Dmg: These columns give the damage dealt by the weapon on a successful hit. The column labeled “Dmg (S)” is for Small weapons. The column labeled “Dmg (M)” is for Medium weapons. If two damage ranges are given, then the weapon is a double weapon. Use the second damage figure given for the double weapon's extra attack. Table: Tiny and Large Weapon Damage gives weapon damage values for Tiny and Large weapons. Critical: The entry in this column notes how the weapon is used with the rules for critical hits. When your character scores a critical hit, roll the damage two, three, or four times, as indicated by its critical multiplier (using all applicable modifiers on each roll), and add all the results together. Extra damage over and above a weapon's normal damage is not multiplied when you score a critical hit. ×2: The weapon deals double damage on a critical hit. ×3: The weapon deals triple damage on a critical hit. ×3/×4: One head of this double weapon deals triple damage on a critical hit. The other head deals quadruple damage on a critical hit. ×4: The weapon deals quadruple damage on a critical hit. 19–20/×2: The weapon scores a threat on a natural roll of 19 or 20 (instead of just 20) and deals double damage on a critical hit. 18–20/×2: The weapon scores a threat on a natural roll of 18, 19, or 20 (instead of just 20) and deals double damage on a critical hit. Range: Any attack at more than this distance is penalized for range. Beyond this range, the attack takes a cumulative –2 penalty for each full range increment (or fraction thereof) of distance to the target. For example, a dagger (with a range of 10 feet) thrown at a target that is 25 feet away would incur a –4 penalty. A thrown weapon has a maximum range of five range increments. A projectile weapon can shoot to 10 range increments. There are melee weapons with a weight of "—". If these weapons are primarily metal (like the kerambit), how do you calculate the cost of creating mithral versions of these weapons? Treat these weapons as 1/2 lb weapons for the purpose of creating a mithral version of the weapon. *Weight: This column gives the weight of a Medium version of the weapon. Halve this number for Small weapons and double it for Large weapons. Some weapons have a special weight. See the weapon's description for details. See FAQ/Errata (at right for information regarding weapons with a Weight of "—" and pricing for crafting them of special materials. Type: Weapons are classified according to the type of damage they deal: B for bludgeoning, P for piercing, or S for slashing. Some monsters may be resistant or immune to attacks from certain types of weapons. Some weapons deal damage of multiple types. If a weapon causes two types of damage, the type it deals is not half one type and half another; all damage caused is of both types. Therefore, a creature would have to be immune to both types of damage to ignore any of the damage caused by such a weapon. In other cases, a weapon can deal either of two types of damage. In a situation where the damage type is significant, the wielder can choose which type of damage to deal with such a weapon. Treated as: If a weapon’s description says it is “treated as” another weapon, a character lacking the appropriate exotic weapon proficiency, can still use it as if it were the other kind of weapon and feats such as Weapon Focus still apply, as do abilities requiring a certain weapon. For example, the butterfly knife allows a proficient user to open or close it as a free action and is otherwise treated as a dagger, meaning she can wield it as a dagger, gain the benefit of Weapon Focus (dagger) when wielding it, use it as the target of a spell that only affects daggers, and so on. Some weapons have special features in addition to those noted in their descriptions. Blocking: When you use this weapon to fight defensively, you gain a +1 shield bonus to AC. Source: Ultimate Combat. Brace: If you use a readied action to set a brace weapon against a charge, you deal double damage on a successful hit against a charging creature (see Combat). Deadly: When you use this weapon to deliver a coup de grace, it gains a +4 bonus to damage when calculating the DC of the Fortitude saving throw to see whether the target of the coup de grace dies from the attack. The bonus is not added to the actual damage of the coup de grace attack. Source: Ultimate Combat. Disarm: When you use a disarm weapon, you get a +2 bonus on Combat Maneuver Checks to disarm an enemy. Distracting: You gain a +2 bonus on Bluff skill checks to feint in combat while wielding this weapon. Source: Ultimate Combat. Double: You can use a double weapon to fight as if fighting with two weapons, but if you do, you incur all the normal attack penalties associated with fighting with two weapons, just as if you were using a one-handed weapon and a light weapon. You can choose to wield one end of a double weapon two-handed, but it cannot be used as a double weapon when wielded in this way—only one end of the weapon can be used in any given round. Fragile: Weapons and armor with the fragile quality cannot take the beating that sturdier weapons can. A fragile weapon gains the broken condition if the wielder rolls a natural 1 on an attack roll with the weapon. If a fragile weapon is already broken, the roll of a natural 1 destroys it instead. Masterwork and magical fragile weapons and armor lack these flaws unless otherwise noted in the item description or the special material description. If a weapon gains the broken condition in this way, that weapon is considered to have taken damage equal to half its hit points +1. This damage is repaired either by something that addresses the effect that granted the weapon the broken condition (like quick clear in the case of firearm misfires or the Field Repair feat) or by the repair methods described in the broken condition. When an effect that grants the broken condition is removed, the weapon regains the hit points it lost when the broken condition was applied. Damage done by an attack against a weapon (such as from a sunder combat maneuver) cannot be repaired by an effect that removes the broken condition. Source: Ultimate Combat. Grapple: On a successful critical hit with a weapon of this type, you can grapple the target of the attack. The wielder can then attempt a combat maneuver check to grapple his opponent as a free action. This grapple attempt does not provoke an attack of opportunity from the creature you are attempting to grapple if that creature is not threatening you. While you grapple the target with a grappling weapon, you can only move or damage the creature on your turn. You are still considered grappled, though you do not have to be adjacent to the creature to continue the grapple. If you move far enough away to be out of the weapon’s reach, you end the grapple with that action. Source: Ultimate Combat. If a weapon is specified as a monk weapon, does that mean that monks are automatically proficient with that weapon? No. It means that they can use this weapon while using flurry of blows. It does not mean that it is added to the list of weapons that a monk is proficient with, unless the weapon description says otherwise. If you want to make a trip combat maneuver, do you have to use a weapon with the trip special feature? No. When making a trip combat maneuver, you don't have to use a weapon with the trip special feature--you can use any weapon. For example, you can trip with a longsword or an unarmed strike, even though those weapons don't have the trip special feature. Note that there is an advantage to using a weapon with the trip special feature (a.k.a. a "trip weapon") when making a trip combat maneuver: if your trip attack fails by 10 or more, you can drop the trip weapon instead of being knocked prone. On a related note, you don't have to use a weapon with the disarm special feature (a.k.a. a "disarm weapon") when making a disarm combat maneuver--you can use any weapon. Note: This is a revision of this FAQ entry based on a Paizo blog about combat maneuvers with weapons. The previous version of this FAQ stated that using a trip weapon was the only way you could apply weapon enhancement bonuses, Weapon Focus bonuses, and other such bonuses to the trip combat maneuver roll. The clarification in that blog means any weapon used to trip applies these bonuses when making a trip combat maneuver, so this FAQ was updated to omit the "only trip weapons let you apply these bonuses" limitation. "There is a special exception to the above rules. If you’re using a weapon with the trip special feature, and you’re attempting a drag or reposition combat maneuver (Advanced Player’s Guide 321–322), you may apply the weapon’s bonuses to the roll because trip weapons are also suitable for dragging and repositioning (this also means we don’t have to add “drag” and “reposition” weapon properties to existing weapons)." Nonlethal: These weapons deal nonlethal damage (see Combat). Performance: When wielding this weapon, if an attack or combat maneuver made with this weapon prompts a combat performance check, you gain a +2 bonus on that check. See Gladiator Weapons below for more information. Reach: You use a reach weapon to strike opponents 10 feet away, but you can't use it against an adjacent foe. ***Strength (#): This feature is usually only applied to ranged weapons (such as composite bows). Some weapons function better in the hands of stronger users. All such weapons are made with a particular Strength rating (that is, each requires a minimum Strength modifier to use with proficiency and this number is included in parenthesis). If your Strength bonus is less than the strength rating of the weapon, you can't effectively use it, so you take a –2 penalty on attacks with it. For example, the default (lowest form of) composite longbow requires a Strength modifier of +0 or higher to use with proficiency. A weapon with the Strength feature allows you to add your Strength bonus to damage, up to the maximum bonus indicated for the bow. Each point of Strength bonus granted by the bow adds 100 gp to its cost. If you have a penalty for low Strength, apply it to damage rolls when you use a composite longbow. Editor's Note: The "Strength" weapon feature was 'created' by d20pfsrd.com as a shorthand note to the composite bow mechanics. This is not "Paizo" or "official" content. Sunder: When you use a sunder weapon, you get a +2 bonus on Combat Maneuver Checks to sunder attempts. Almost every culture features warriors who fight for sport and entertainment. While only the most decadent or evil cultures enjoy all-out blood sports in which the combatants fight to the death for the pleasure of the crowd, even the most benign societies enjoy the spectacle of armed conflict. These conflicts often require specialized weapons and training to get the most out of such performance combat. Performance is a weapon quality that grants bonuses when using the weapon in performance combat. Performance weapons tend to be the preferred weapons of warriors who fight in the arena or some other forum where showmanship is just as important as scoring a debilitating blow or deadly hit, and these weapons are often well known to the spectators of such events. There is another way in which a weapon can gain the performance quality. A creature can take the Performance Weapon Mastery feat, which allows any weapon it wields to gain the performance quality. A masterwork weapon is a finely crafted version of a normal weapon. Wielding it provides a +1 enhancement bonus on attack rolls. You can't add the masterwork quality to a weapon after it is created; it must be crafted as a masterwork weapon (see the Craft skill). The masterwork quality adds 300 gp to the cost of a normal weapon (or 6 gp to the cost of a single unit of ammunition). Adding the masterwork quality to a double weapon costs twice the normal increase (+600 gp). Masterwork ammunition is damaged (effectively destroyed) when used. The enhancement bonus of masterwork ammunition does not stack with any enhancement bonus of the projectile weapon firing it. All magic weapons are automatically considered to be of masterwork quality. The enhancement bonus granted by the masterwork quality doesn't stack with the enhancement bonus provided by the weapon's magic. Even though some types of armor and shields can be used as weapons, you can't create a masterwork version of such an item that confers an enhancement bonus on attack rolls. Instead, masterwork armor and shields have lessened armor check penalties. Splash weapons are described under Special Substances and Items. It is next to impossible for any game to cover every conceivable weapon from all cultures, eras, works of fiction, and players' imaginations. In many cases, new weapons can be represented as slightly different versions of existing weapons, such as a Chinese dao that uses the shortsword rules. However, for those cases when new weapon statistics are truly needed, this section introduces rules for GMs to use as guidelines. This weapon design system allows you to create a new weapon by buying weapon qualities with Design Points (DP). The number of Design Points a weapon receives is determined by whether it is simple (4 DP), martial (5 DP), or exotic (6 DP). All new weapons begin with the following base statistics: Dmg (M) 1d3; Critical ×2; Type any one (B, P, S); Price 1 gp × the weapon's base DP. In addition, you choose whether your base weapon is a melee weapon or a ranged weapon. If you choose ranged, you must decide whether the weapon is a projectile weapon or a thrown weapon. A projectile ranged weapon has a 50-foot range increment and uses ammunition, while a thrown ranged weapon has a 10-foot range increment. Fighter Weapon Group: You must choose the fighter weapon group (or groups) to which your weapon belongs. When determining this, pick the fighter weapon group with the most weapons that have similar statistics (in the case of ranged weapons, the group with the most weapons that are reloaded in the same manner). Some fighter weapon groups grant weapons additional abilities, as noted below. Double: The weapon gains the double special feature. You pick the damage type of each of the weapon's ends separately. If you choose the additional damage type or the improved damage quality with the weapon (see below), treat each end as a separate weapon when determining the Design Point cost of that quality. Monk: A weapon can be placed in the monk group only if it gains the monk weapon feature (see below). Hands: For melee weapons, you must choose whether your weapon is light, one-handed, or two-handed. For ranged weapons, you must choose how many hands it takes to attack with your weapon and (for projectile ranged weapons and slings) how many hands are required to load it. The base number of Design Points of one-handed and ranged weapons increases by 2, and the base number of Design Points of two-handed weapons increases by 3. Weight: When determining a weapon's weight, use the weight of a weapon with similar damage and features. When designing a new weapon, you can choose from the following weapon qualities. Each quality can be selected once unless otherwise specified. Additional Design Points (0 DP): Increase the weapon's available Design Points by 1 and its gp price by 15. This quality can be selected twice for one-handed weapons and ranged weapons, or three times for two-handed weapons. Additional Damage Type (Varies): Select an additional type of damage (B, P, or S). The weapon deals the selected type of damage either separately from its original damage type (such as “P or S”) or simultaneously (such as “P and S”) . This quality costs 1 DP if the types apply separately and 3 DP if they apply simultaneously. Aerodynamic (1 DP): The weapon has a 10-foot range and can be thrown up to 5 range increments. Only melee weapons can have this quality. Attached (1 DP): The weapon is attached to the wielder's arm and cannot be disarmed. 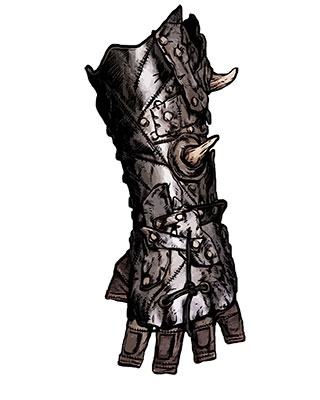 The wielder can wield or carry items in the hand to which this weapon is attached, but she takes a –2 penalty on all precision-based tasks involving that hand (such as opening locks). This penalty can be removed by increasing this quality's cost to 3 DP. Concealed (1 DP): The weapon is easy to hide, granting the wielder a +2 bonus on Sleight of Hand checks to conceal it. Only light and one-handed melee weapons and ranged weapons that need one hand to fire can have this quality. Ease of Grip (1 DP): The weapon can be wielded as a two-handed martial weapon. Only one-handed exotic weapons can have this quality. Expanded Range Increment (1 DP): The weapon's range increment increases by 10 feet, up to a maximum range increment of 30 feet for thrown weapons and 120 feet for projectile weapons or slings. This quality can be selected multiple times. Finesse (3 DP): The weapon can be used with Weapon Finesse as if it were a light weapon. Only one-handed and exotic melee weapons can have this quality. Fragile (–1 DP): The weapon gains the fragile special weapon feature. Improved Critical Multiplier (Varies): Increase the weapon's critical multiplier by 1. This quality can be selected twice. It costs 3 DP the first time it is selected, and 6 DP the second time. It can be selected only once if the weapon has the improved critical threat range quality, in which case the Design Point cost is doubled. Improved Critical Threat Range (Varies): Increase the weapon's critical threat range by 1. This quality can be selected twice. It costs 3 DP the first time it is selected and 7 DP the second. Improved Damage (1 DP): Increase the weapon's damage dice by one step (1d3 to 1d4, 1d4 to 1d6, 1d6 to 1d8 or 2d4, 1d8 to 1d10, or 1d10 to 2d6 or 1d12). This quality can be selected three times for light weapons, four times for one-handed weapons and ranged weapons, and five times for two-handed weapons. Among weapons sized for Medium characters, the maximum damage is 1d6 for light weapons, 1d8 for one-handed weapons (1d10 if exotic), 1d12 or 2d6 for two-handed weapons, and 1d10 for ranged weapons (1d6 if used or thrown one-handed). Lesser Damage (–1 DP): Reduce the weapon's damage by one step (1d3 to 1d2). A weapon cannot have the improved damage quality and this quality simultaneously. Shield (1 DP): The weapon counts as a light shield made of wood or metal and can have armor spikes (your choice). Add the gp price of the shield and any armor spikes that the weapon gains from this quality to the weapon's gp price. This quality can be added only to one-handed melee weapons. Spring-Loaded (2 DP): The weapon's wielder can activate or suspend its reach as a swift action. This quality can be added only to one-handed or two-handed melee weapons with the reach special feature. Strong (1 DP): The weapon's wielder gains a +2 bonus to her Combat Maneuver Defense to resist sunder combat maneuvers attempted against the weapon. Tool (0 DP): The weapon can also serve as a specific mundane tool. Add triple the price and double the weight of the tool to the weapon's final price and weight. Traditional (1 DP): Select one race with the weapon familiarity racial trait (such as elves or orcs). Members of that race with the weapon familiarity racial trait treat the weapon as a martial weapon. This quality can be applied only to exotic weapons. Weapon Feature (Varies): Choose one of the following weapon special features for the weapon: blocking, brace, deadly, disarm, distracting, grapple, monk, nonlethal, performance, reach, or trip. This quality can be selected twice for martial weapons and three times for exotic weapons. It costs 1 DP the first time it is selected, 3 DP the second time, and 4 DP the third time. The following are examples of weapons created with the weapon design system. The innovation behind a gnome flick-mace, which has an ordinary mace head, lies within its spring-loaded haft and protruding handles. When the mace is compressed, removing the handles instantly springs the mace to its full size. While it is extended, a quick flick of the wrist allows the weapon to be compressed. Price 54 gp; Type two-handed melee; Proficiency exotic; Damage (M) 1d12; Damage (S) 1d10; Critical ×2; Weapon Group polearms; Weight 12 lbs. Also known as a “monk's staff,” the khakkhara is often used as a ceremonial walking stick for scholars and priests. It consists of a wooden shaft 5 feet long with a large metal loop or cage-like structure on the top end. Multiple small rings hang from the cage, chiming with the movement of the staff. Price 7 gp; Type two-handed melee; Proficiency simple; Damage (M) 1d8; Damage (S) 1d6; Critical ×3; Weapon Group monk; Weight 10 lbs. This iron flute whistles when used to make attacks, unless its many holes are filled with cork or wax. Price 16 gp; Type one-handed melee; Proficiency martial; Damage (M) 1d8; Damage (S) 1d6; Critical ×2; Weapon Group hammers; Weight 7 lbs. With a ranged weapon, you can shoot or throw at any target that is within the weapon's maximum range and in line of sight. The maximum range for a thrown weapon is five range increments. For projectile weapons, it is 10 range increments. Some ranged weapons have shorter maximum ranges, as specified in their descriptions.